Discussion in 'Park Construction' started by roomraider, Jun 27, 2018. I swear there was a thread for this? I must be going mad. Anyhow this is a fairly decent sized new park opening in Suzhou, China this year. 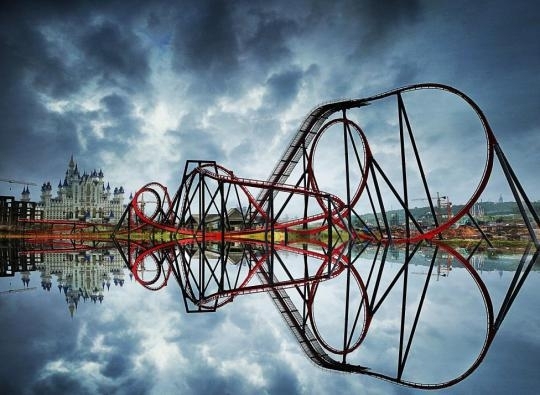 The park is being built by Huayi Brothers a large film company over in China and will utilise many of their IP's. Think kind of Universal Studios Lite. The park features a large number of indoor dark rides as well as 3 known coasters. The Junior is a standard model roller skater type while the spinning coaster is a brand new custom model and one that looks rather good. Pictures are as usual hard to come by so some of these are super old. Some of the best photoshop ever right here. Hmm, yeah I swear you already made a topic, couldn't find anything using the search tool though. Maybe I'm just used to seeing your social media posts about it. That photoshop job on the spinner is incredible. Is that enormous statue part of the park? Very impressive indeed. One thing I will say about Chinese theme parks is that they seem to have very impressive theming! A couple more shots of the now complete B&M wing coaster. Matt N, Jaiden M., Pokemaniac and 1 other person like this. b&mfanboy123, Coaster Hipster, Pear and 2 others like this. Hey, any idea why this is still under construction on rcdb ? Is he wing actually open ? Video of the wing coaster. Odd that the train has 8 cars. b&mfanboy123, EpochEmu, Matt N and 1 other person like this. Quite a few of them have 8 car trains, Gatekeeper, a number of the chinese ones, and X-Flight, to name a few. vaugc002, Thekingin64 and Matt N like this. I was going to post those several hours ago but I could not find it for the life of me. The search function needs work. Anyone notice layout similarities between this and the one at Colourful Yunnan Happy World? Cranedude and b&mfanboy123 like this. This is a clone of the Hotgo wingrider tho. ^Yes, I know. My point still stands. Antinos, Lofty and Pear like this. Quite a bland layout this, even for a wing coaster. Majority of the elements are those corkscrews and zero G rolls that crawl over the apex. I'm not a fan of the push/pull flow of the bigger wings although I imagine it rides smooth as butter. I'm on the opposite side of the coin. I would love to see a clone of this pop up somewhere Stateside (hello, SFGAdv: looking at you). I'm completely in love with the wing over dive and loop combo - I'd imagine that the sustained positive Gs would lead people to believe that this model is a more intense wing coaster. The rest of the layout flows quite nicely as well. It looks like all of X-Flight's sexiness in a slightly bigger package.